BeoVision 7 was introduced in the early days of LCD technology and accordingly the first examples - the relatively poor screen, lack of resolution and fewer connections - meant that compared to a lot of other manufacturers, the purchaser didn’t feel as though he or she was getting total value for money. But all of that has changed with newer models replacing the more elderly BeoVision 7 examples and quality now oozes every which way. BeoVision 7-32 MKII replaced the first variant, the BeoVision 7-32 MKI. Everything about th BeoVision 7-32 MKII gave the impression of quality: from its glass-finished, high-gloss black screen frame through to its anodised aluminium outer trim. A range of stand options in a good range of colours ensured that the TV complemented a home environment suitably well. And with a choice of speakers, an individual TV could be created - a bespoke receiver, waiting to do its owner’s bidding from the included Beo4 remote control handset. A personal choice of matching speaker was waiting to be made, from a three-way stereo version, the smaller BeoLab 7-1 or the longer BeoLab 7-2, or the monophonic centre-speaker BeoLab 7-4 for inclusion within a home cinema set-up. Underneath the screen was its inbuilt DVD player which slid gently open out of its bulge, ready to take a DVD or CD. There was even a light built into the tray to help the user in a darkened room. 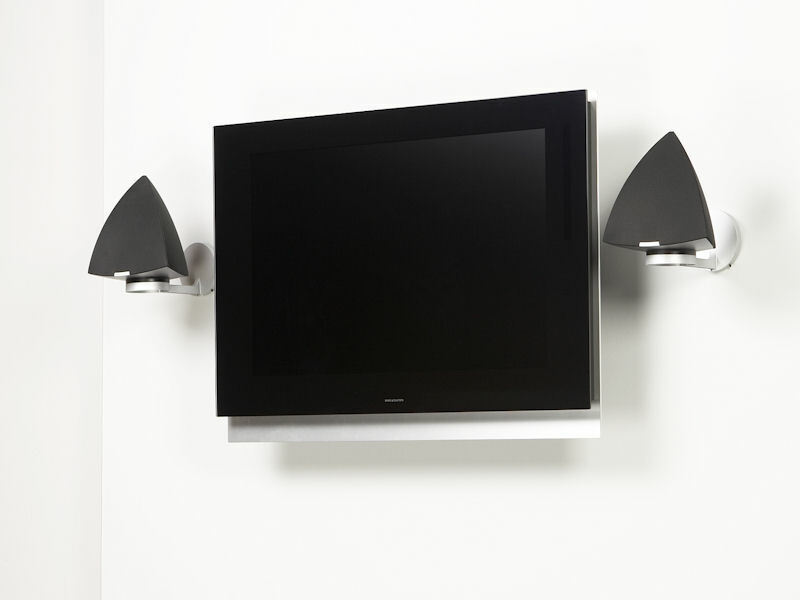 Available stands for BeoVision 7 included a table stand, fixed wall bracket for TV and loudspeaker, motorised table stand and a motorised floor stand, as well as a moveable wall bracket for TV and loudspeaker. On its special stands BeoVision 7 tilted and turned to suit a wide variety of viewing position and the motorised table and floor stands turned the set through an arc of 70°at the touch of a button. BeoVision 7 was delivered as standard with a Dolby Digital/DTS Surround Sound module, MasterLinkmodule, Set-Top Box Controller for satellite reception and control, RF Modulator, an Anti-Reflex Coated Contrast Screen and DVI PC input. With a choice of 32″ and 40″ versions the BeoVision 7 was a very desirable TV which offered mix-and-match components and offred excellent sound and vision possibilities. The 40″ version incorporated BeoSystem 3, an advanced digital surround sound processor and was full High Definition. VisionClear technology monitored the surrounding light levels and adjusted the brightness and contrast of the set accordingly. All versions of the BeoVision 7 included regular software updates. However, for Mark I & II versions customers had to purchase a special kit in order to make thir TVs HD-ready. Cabinet finish Silver, Black, Dark Grey, Red, Blue. IR control outputs: Built in - (IR-blaster included). FM sound system G : 5.5MHz or FM sound system I : 6MHz depending on setup.